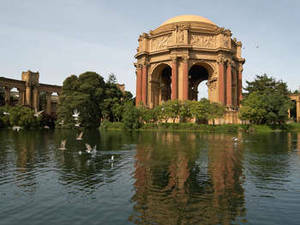 Description: Free picture of the Palace of Fine Arts in San Francisco, California. This image shows the classic Roman rotunda, that is part of the exhibit, from across the water. Sunshine, birds and lush greenery are also visible in the photo.